Set in the heart of the Cambridgeshire countryside, Hallmark Hotel Cambridge comes together with the Cambridgeshire Golf Club to create the perfect destination for a short golf break. The championship golf is one of the most popular courses in the region, an awesome parkland affair that will test your game. 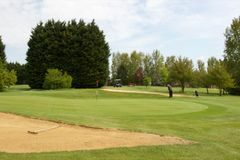 The Hallmark Hotel Cambridge enjoys a fantastic location just on the outskirts of Cambridge, allowing golfers to make the most of the iconic British city when they are not teeing it up. Inside the hotel, you are treated to lovely modern bedrooms and a number of great facilities including a swimming pool and spa. Sunday arrivals receive £10pp bar credit! 1 in 16 goes free Monday-Saturday arrivals in 2019! The tree-lined fairways make accurate striking imperative, while the beautiful surrounding landscape makes the course one of the most attractive to be found anywhere. When played from the medal markers, the Cambridge measures 6,575 yards, making it a stern test for highly-skilled players, but there is a good variety of tees to ensure that the course is suitable for all visitors. Follow in famous footsteps - Watson, Faldo and Ballesteros are among the great names to pound the Cambridge fairways. Just five miles from the charming heart of the famous university city, the Cambridge Hotel blends an idyllic setting with fine contemporary décor to provide a superb golf break destination. The splendidly appointed guest bedrooms combine elegant style with excellent fittings and furnishings, including all the modern amenities for a comfortable stay. With easy access to the golf course and the delights of the beautiful city, the Cambridge Hotel is perfect for a fantastic golf break. The Waves Health and Leisure Club is equipped with an array of options including a steam room, spa pool, sauna, and an indoor swimming pool. Alternatively head to the excellent gym or the tennis court for a serious work out, or to the beauty salon to be pampered from top to toe. The Brasserie Restaurant and the Gallery Bar are the ideal place to relax with friends during your next golf break. Excellent location for a group golf trip-staff very helpful especially Ed in the golf shop. Highly recommended. As a previous visitor, knew what to expect. Only draw-back, was that only one set of towels for the twin room available. Everybody is Friendly and it’s a very clean quite hotel. The only very slight negative was we had a 15 minute wait at an understaffed bar. Really nice course-in good condition.Played in October so leaves on the ground as you would expect caused a lot of ball searching! Overall very good value. Saturday was an average time round, but on Sunday some greens soggy due to rainy conditions. Group before very slow and would not let us through. Great deal with the 50% off buggies which for myself and brother made for easier round and greater enjoyment. Hope to get the same deal next year ! Superb facilities plenty of upkeep going on and some of the Best greens I had played on all year, it has surprisingly many challenges along the course, we had a little slow play due to way too many leafs over the fairways with even some perfect drives were getting lost... could do with a good leaf blower. Right on the hotel this course is just perfect for a weekender/midweek stay.